Are the 'Great' Violins Really So Great? I recently posted an article on the Huffington Post where I examine what makes a violin "great". Hopefully some of you will find this interesting. "...I have heard people speak of the greatness of the old Italian violins as a myth, the implication (stated and unstated) that violinists are being taken in by the name, history and price tag..." and your answer that no, Itzhak Perlman and Anne-Sophie Mutter and Maxim Vengerov and for that matter, YOU, are not just enamored of a famous name or an "idea" of a violin. With real relationships that have lasted years, even decades, with these instruments, the very finest violinists of our time know well which instruments help them to reach for and achieve that elusive last one percent of refinement that it takes to be a truly great player. April 5, 2013 at 05:52 AM · You wrote: "Every day my Strad pushes me to be ever more refined, ever more creative, and, most importantly, ever more directly communicative with my playing. And this is really the measure of greatness for a violin." Having followed your career for many years it's clear your push to be every more creative and directly communicative is the measure of your greatness as an artist and the source of great the enjoyment you give so many of us. Thank you. If you would be willing to be involved in the testing, or in setting up a testing or selection scenario which you feel would more accurately reflect the selection process of great players (but without knowing the identity of the fiddle), that would be wonderful. April 5, 2013 at 11:07 AM · Hi James, impressive post indeed. It has prompted me to relate here an experience of mine of some years past that may in some way have a pertinence to the subject of new vs. old, or even more precisely, violin vs. violin. An acquaintance of mine prepares and races cars on week ends (the rest of the time he's a rocket scientist - really) and I was overjoyed when he let me try his modified Porsche 944 S2. So I hit the gas, tried feeling for the car’s limits, enjoyed the power, and felt like Schumacher for a few minutes. I know something about cars, have driven over 150 mph in my younger years, so I had a good time. Then my friend took the driver’s place. In his hands, the Porsche became a demon. At one point I literally had to hang on to the door as he took a freeway offramp marked 40MPH at an ungodly 110, wondering how the laws of physics could be cancelled out by simple steel and rubber, while feeling my teeth pulled by centrifugal force. I realized then that I had not even came close to reaching the limits of this car while I was driving. My point: I learned that anyone can take a Chevy Malibu or a Chrysler Town-and-Country to its limits. But only a small few - and with considerable practise - can make a race-prepared Porsche 944 S2 really perform… and maybe the same holds for the greatest violins too. Thanks for taking time to post here. Great article! It is nice to read the perspective on this topic of someone like you, who has been playing these instruments so wonderfully for a long time! April 5, 2013 at 02:46 PM · I appreciate, in particular, your emphasis on the relationship between player and instrument. That is something no blind test can reproduce, unless, rather than have each violinist play all the violins, each violinist plays her/his own 'voice,' using the same music, attempting to match nearly as possible the same phrasing, to show off what each instrument does best in its own interpreter's hands. April 5, 2013 at 03:29 PM · "...chosen for their ability to bring out the best in their players, to bring their players ever closer to the ideal of communicating musical emotion fully and without barrier..."
April 5, 2013 at 06:50 PM · A timely discussion, as I am just preparing to interview Steven Staryk for his thoughts about his experiences with some of the great violins. On his recent anthology can be heard a sampling of the approximately 40 Strads, 26 Del Gesus, and many other instruments. He's also owned contemporary instruments as well. The 3rd of the comments after the Huffington article refers to a "placebo effect" but it wasn't entirely clear what the commenter meant. Personally, I'm pretty accurate in guessing whether a Strad is used on recordings. They simply cannot be mistaken for other instruments. 1. There is a bias that many, if not most listeners have. They tend to prefer the brightest and loudest instrument right away, without having to listen to an entire recital of varied works, during which time their ear may tire of the louder and brighter instrument. 2. The tests are played by people who have not spent the necessary time to be able to play the instruments to their potential. On some tests, you can hear the player drive the older instruments too hard, letting the sound crack in a way that wouldn't happen with a newer instrument. Staryk didn't just pick up these instruments and go into the studio--he had to learn to play them. It's possible that he's had more long-term concert experience with more instruments than anyone alive. Anyway, look for the interview soon. I have no idea what he'll say, so I may be surprised at the answers myself. 1. There is a bias that many, if not most listeners have. They tend to prefer the brightest and loudest instrument right away, without having to listen to an entire recital of varied works, during which time their ear may tire of the louder and brighter instrument." Maybe so, but this thread suggests otherwise. Respondents seemed to prefer the darker violin. "2. The tests are played by people who have not spent the necessary time to be able to play the instruments to their potential." That can be true for any instrument, whether old or new, so it's hard to see how that would give either category an advantage. April 6, 2013 at 02:46 AM · The flaw that I see with Musafia comparison to cars and violin potential is that I believe we are not comparing a student model new instrument to the great Strad or Guarneri which is comparing a race prep Porsche to a Malibu or minivan. A more accurate analogy would be an old classic sports car ex. Toyota 2000gt or 57 Shelby etc (representing the classic vintage violins) and a new Ferrari or GTR etc (representing modern violin). I think there are amazing features of old and new and it comes down to what makes you play better and happier. If that placebo effect makes the player feel that much more expressive then it is working for the player. April 6, 2013 at 06:24 AM · Viran, your point is well-taken. I don't consider contemporary master-made instruments anything less than the Strads of the future, so your analogy is spot-on. My intent was only to underline through exaggeration! hi James ; thank you for the article. you say you "examine" what makes a violin great. if i understand it well, in it you express your doubts concerning the old-vs new trials and an assertion that there is a reason why good old violins are favoured by great players, namely that they afford an added dimension not measurable within the limited scope of such trial contests. however, there is a bit of ambiguity. 1- you are defending good old violins from being debased in any way by coming out as losers in the contest but you could essentially neutral about the question old vs new. a polite stance. 2- you are actively weighing on the side of the old violins since there you actively refrain from making any remark concerning modern violins and since you support the distinction of old from new. in other words, you pay compliments to one category and politely bypass the other (for your own purposes). would it be brazen to make a clear jugement - for your own purposes as a player and based on your experience- on whether good modern violins can or cannot afford that added dimension and that you were able to perceive with good old violins? David Burgess' invitation sounds alluring in the context of that question. April 6, 2013 at 02:17 PM · Tammuz, those are questions without easy answers. Perhaps the researchers and Ehnes could work out some answers together? In one of the tests which Mr. Ehnes seems to be referring to, the researchers kind of sidestepped the difficult time issue, with a rather clever design element of the test. By posing the question, "Which violins would you want to take home with you (for further testing)", they get pretty close to the first step in a normal selection process. Instruments which don't pass that first stage are unlikely to be contenders in the more thorough trials that musicians typically follow up with, so they have basically become non-contenders. While that certainly doesn't tell one everything they need to know about an instrument, it still reveals a lot! So no one is claiming that one can fully evaluate an instrument, either new or old, by playing it for a short time. But playing a variety of instruments for a short time IS a normal step in the typical selection process that musicians use, which bears heavily on the eventual outcome. The placebo effect is already quite well known and validated from previous experiments, so that's one reason there is emphasis on these experiments being conducted double-blind. I don't happen to have any information on who is or isn't most susceptible, but I suspect that the researchers do. You say we live in times of skepticism. We also live in times when every scientific claim (thank lord!) also has to be supported by scientific studies. I have personally not followed every study on violins, but my guess is that many of them are thought through. Of course, the performer also has a natural bias to play better on a certain type of violins. But then, as the performer gets better, you will get another bias: a sociological one. The rumor says finer performers should have finer and more expensive instruments, and the reputation that the old Italian ones are "better" still joins today. Naturally, a larger fraction of performers at higher levels will have a greater chance to be exposed to Italian instruments, and be more used to them. "I would ask these people if they really think that Itzhak Perlman is not a better judge of a violin's capabilities than they are. Or Pinchas Zukerman. Or Anne-Sophie Mutter. Or Maxim Vengerov. I could go on and on." April 6, 2013 at 03:42 PM · Another questionable assertion in the article is that "more often than not the point of these exercises is simply to see the old instruments fail." While I can't rule out that a few contemporary makers may have tried to pull some promotional garbage like that (I might even be able to think of a couple of likely candidates (wink)), I've attended quite a few comparison events, and it would be highly atypical. The most common comparison scenario is one which every musician is familiar with: Some musicians get together on their own to compare instruments, probably because someone wants to see how an instrument they are considering purchasing stacks up. They hear what they hear, and believe what they believe, and there's not much that even a pushy modern maker with an agenda can do about it. If a Strad or two are present, they may come out on top, or they may not. It's a learning experience for everyone involved, including a maker, if one happens to be involved. The more formal studies have a heavier data acquisition and research component. For instance, a question might be, "Makers keep trying to copy old Italian instruments, which are the traditional reference standard. Is that really what they should be doing? How successful is this? What is a "good fiddle" anyway, and what makes them different? Do opinions of players and listeners change when the identity of the violin is taken out of the picture?" David: I would love to be involved in some sort of a scientific study. Please send me a PM with the Oberlin dates. I kind of doubt I’ll be free to make it, but it sounds fascinating. And when it comes to violin-geekiness I am second to none, so I think I’ll fit in just fine. ? One of the major problems with violin testing is that it can’t be a one-size-fits-all kind of thing, since every player is looking for something different, and makes their career doing fundamentally different things. For someone like myself, any trial that doesn’t primarily take place in a large concert hall is going to be of little value, since that is where I work most of the time. But I have very specific desires and needs. Someone who plays primarily in a string quartet might gravitate to something different. Or, we could very possibly love the same instrument, but want it set up in different ways. If I weren’t playing concertos as the main focus of my career, I would definitely have my Strad set up differently. Dimitri: I love that story, and absolutely see the parallels with violins. Not many people are going to know how to push a 944 S2 to the limits (much less an F1 racecar), nor would they want to or ever have any reason to do so. Again, it’s an issue of different players (drivers) having different wants and needs. Some of the qualities a soloist looks for in a violin are not things that would be of a great deal of use to most players, nor are they things that many players would even be able to identify. I drive almost every day, but I would never claim to be able to select a car for Sebastian Vettel! Douglas: YES, absolutely it applies to both old and new instruments. Scott: I’ll look forward to seeing that interview with Mr. Staryk. There’s no question he’s had more experience with different instruments than just about anyone. The placebo effect comment on HuffPost had me scratching my head as well, and I think Tammuz asks a great question: who indeed is suffering from this effect, if it is there at all? Presumably, a placebo is effective when the susceptible patient wants it to be. So we’re looking at motivation. Is it more likely that someone would actually desire to sacrifice his or her entire financial future (even just insuring a Strad can cost $10-20K a year, and that, obviously, is not invested money – it is just gone) and go through the hassle of traveling with a multi-million dollar piece of history, or that he or she would convince themselves that a less-expensive instrument is just as good for their purposes? As far as the flaws of the tests go, I would agree with you that for many listeners in a live environment their first instinct is that louder equals better (David, I think this is different for a recording, where differences in projection are minimized and differences in color are more noticeable). I don’t think that this necessarily favors old or new violins as a general rule, but I do think it favors certain types of setups and certain styles of instruments. I’ve personally had a number of experiences where one violin sounds considerably louder than another in a dealer’s studio, and then the roles have reversed entirely in a concert hall. As for your second point, I also agree – but agree with David that it can be the case with old or new violins, so it doesn’t necessarily constitute and advantage (not that this was necessarily your point). Viran: I like your analogies but I hope you don’t mind me saying that I think comparing older cars with older violins misses the point of the violin as a performer’s tool. I love old sports cars, but never would I consider them to be better for any kind of competitive driving! Cars have unquestionably improved. They are faster, safer, more stable, and easier to drive with precision. But violins? Regardless of whether one determines that a great new violin is better for one’s purposes than a Strad, for example, I don’t think one can say that the violins of today are fundamentally better or more technologically advanced. And again, that placebo effect…… frankly, I don’t think the top violin soloists can afford to fool themselves into thinking something that isn’t so. It’s just too competitive an industry. I don’t see any reason not to trust top soloists with their picks of instruments, and that was a point I wanted to make in the article. Christian Tetzlaff feels that a violin made by Peter Greiner in 1999 is what will serve him best. Itzhak Perlman feels that a violin made by Antonio Stradivari in 1714 is what will serve him best. These are two VERY different players, who strive to do very different things. I don’t see any reason to second-guess either of their choices, nor to assume that either of them feels any motivation for picking an instrument other than trying to find the best possible instrument for achieving their musical goals. A trial was done in a hotel room – a sound environment that could not possibly be more different than that of a concert hall – with a group of players with vastly different abilities and experiences. A couple of Strads and a Del Gesu were pitted against three top modern instruments. The Strads and Del Gesu were, according to the researcher’s own website, not allowed to be adjusted in any way (unbelievably, they were supposedly not even allowed to change the strings). The modern instruments were hand picked for the experiment. The results found that the majority of the players were not able to identify the old violins, and, in fact, only 8 of the 21 (of which 19 identified themselves as “professionals” and 10 had degrees in music…. draw your own conclusions) chose an older violin as their favorite. Now, I don’t mean to speak badly of Ms. Fritz’s test, her methods, or her ideology. I have a great deal of respect for her and what she is trying to accomplish. But I frankly don’t see how this can possibly be seen as proving anything, other than trying to identify the best violins in a hotel room is a bad idea. But many people locked on to this as “proof” that violin soloists who choose old violins are full of it. I’ve had people basically call me an idiot (most often online, where everyone is full of courage ?, but sometimes in person) for choosing to play a Strad, when it has been “scientifically proven” that modern instruments are at least as good. I would propose that we look at this in the context of Occam’s Razor. Make a list of violin soloists who choose to play primarily on a modern instrument (Christian Tetzlaff, maybe some others?). Make a list of violin soloists who choose to play primarily on an old Italian instrument (virtually everyone else). Should we assume that A: 95% of violin soloists are idiots? Or, B: maybe there really is something special in these violins? I want to be perfectly clear: I think there are WONDERFUL violins being made today (such as those by our friend David, as well as many others). When players ask me for advice about purchasing a violin, I most often try to push them in the direction of a top new instrument. Good old violins are valued for their history as well as their sound, obviously, so a new violin and an old violin that are of comparable “quality” are going to be wildly different in price. And yes, there has traditionally been a silly bias in favor of old violins, and it is a good thing that people are seeing that in a clear light. But if that player is one of the very, very few for whom the success of their career might be determined by one half of 1% difference in tonal beauty, variety, or projection? I think that Stradivari and Guarneri del Gesu were geniuses. I strongly believe violin making is as much art as science, so why shouldn’t there be geniuses from a golden age? People can accept that there was one Shakespeare, one Leonardo, one Beethoven. That doesn’t take away from the achievements of countless other great writers, artists or composers. So, to wrap this up: I have played on a number of extraordinary modern violins that would be perfectly wonderful instruments for the pursuit of many violinistic careers. But I haven’t found a modern violin that surpasses my Strad for my specific purposes. I have no idea why this is the case. And EVERY DAY I wish I would. My life would be immeasurably easier. Sverker: You make great points. I think it’s safe to say that violin soloists have access to more great violins than others, and are quite regularly exposed to modern instruments (at least in my experience and that of many of my colleagues). They overwhelmingly choose Strads and Del Gesus as their primary concert instruments. You make an excellent point about opinions by authority not being scientific by nature, but I think it is fair to give great weight to the opinions of those who by the very nature of their careers are generally considered to have the best judgment of musical sound. I think this should carry at least as much authority as “scientific” tests that have many insurmountable and inherent flaws, as so many have pointed out. Which is not to question the noble intentions of these tests, or the value of the information they provide. I did not mean to imply that these studies were not “thought through”. But why is having 21 violinists of various backgrounds and abilities trying out 6 violins in a hotel room while wearing a welding mask considered compelling evidence of anything if the personal experiences of the popularly determined greatest violinists in the world is not? As far as the sociological bias favoring old violins goes, I agree that that is a very interesting part of the equation. But I think there is much less to that today than there was years ago, and an argument can be made that it has swung at least somewhat in the other direction. Speaking very practically (and, again, from my own experience), there is a considerable amount of PR value today in playing on a modern instrument. Some of my colleagues joke about advertising playing on a modern instrument, even if they don’t, just for the sake of the media interest! But I’m afraid that all of this has gotten away from the original point of the article. You write that the main point is about what violins are better, modern violins or old Italian ones. But that was not really the point of my article; my point was (and is) that the greatness of a violin is in the possibilities it affords to its player – and that has nothing to do with the instrument’s age or place of manufacture. David: You’re absolutely right, I was being unfair in saying that “more often than not” the point of these tests is to see the old instruments fail. I was reacting rashly to a number of studies that I have seen, taken part in, or read about that seemed to be pushing a new instrument agenda, and the enormous amount of press that was generated by the Indianapolis test, which struck me as being significantly, if totally unintentionally, flawed. But I do believe that for a number of them, that is precisely the point. Of course, there are plenty of tests that have unfairly favored the older instruments as well. Where there’s money to be made, whether it is by makers or by dealers, people will push their agenda. There’s no getting around that! The questions you pose in your final paragraph are the truly interesting ones. And ones that have no real answers, at least yet! But I greatly admire the efforts of those like yourself who are trying to get to the bottom of it all. Thanks to all of you for weighing in on this. April 6, 2013 at 06:58 PM · Thanks for responding, James. Very artfully done! A small number of makers enter into various types of promotional deals with players, so it can be hard to know what it really means if a performer owns or performs on a contemporary instrument. We all know that if a famous athlete uses a particular brand, at the very least, they probably didn't pay for it. They probably even get paid to use it. What might be less common knowledge is that a little of this type of thing has gone on with contemporary makers. 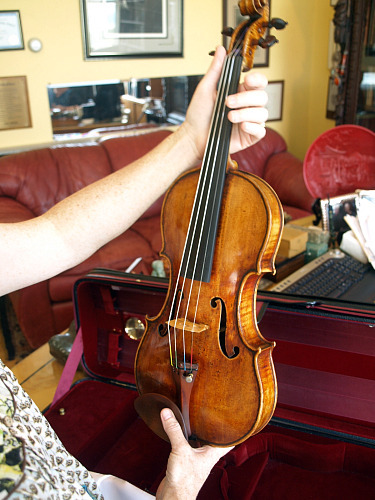 At the same time, it can be hard to know what it means when someone owns a Strad. Many are owned by amateur players, and sometimes by people who don't play at all. There is a historical, collectable, and investment value which has only a tentative connection to how a particular instrument performs as a music making tool. Consider that some paintings have fetched enormous prices, way higher than any violin, even though they just hang there on a wall, and don't even produce music. Another thing which can take place anywhere in the contemporary arts and crafts community: Manipulating auction prices. Let's say a painter wants to set a public and impressive price reference for his work. It's pretty simple. He has someone put one of the paintings the artist owns in a high-profile auction, has two accomplices bid the price up (acting like they are competing against each other), and one ends up purchasing it (on behalf the artist that painted it). The artist gets his painting back, along with most of the money he spent to buy his painting from himself (minus auction house fees), and now there's a searchable public record that his work is worth a lot of money. Has this ever been done by a modern instrument maker? Probably. I don't care for any kind of practices which intentionally deceive people, or carry a high probability that people will be deceived, but there you have it. Obviously, not everyone feels the same way I do. No one experiment by Claudia Fritz (post-doctoral at the University of Cambridge) is intended to be conclusive in an old versus modern debate. Maybe that's a debate which wasn't even intended to happen out of the experiments. I'm kind of on the fringes, so can't say for sure. It's unfortunate when the press portrays it that way. They seem to jump on anything mentioning Stradivari, when they have a slow news day, and sensationalize it to their own ends. The issue of violin sound is complicated enough, that most good researchers take it on in small bites. It's even complicated enough, that many engineers and physicists get involved, just because they consider it a special challenge. The Indianapolis test focused on the initial selection process, which typically doesn't take place in a hall. Two more tests have been done since then, one in a concert hall in Paris, and another in a hall in New York, but published scientific-type papers haven't emerged from these yet. Sometimes they have, but the Strads they have been compared with are the outcome of a selection process spanning about 250 years. Hard to say how either selection process affects the testing. What's really cool is that this thread has served as an example of how players, dealers, and makers can work together for mutual benefit. Not that some dealers and players haven't been been hugely supportive of contemporary maker's efforts and experiments for about 150 years now. We makers are in debt to them. All the way through I'd been wondering this very thing, if players were approached with -ahem - sponsorship or promotional opportunities. ( its so difficult to splash 'carltons' across the frock of the concert violinist, perhaps a litle banner hanging off the scroll ). I oft find myself wondering if Hilary Hahn gets approached to try out an alternative to her vuillaume - neither italian nor modern, it sits there in a no mans land, its greates value will come on her departure from the mortal coil and it can be come the hahn vuillaume. would she sound different on another instrument considering all of her adult years have been spent on this one? April 6, 2013 at 11:56 PM · On my end, I've mostly been solicited by players, because I haven't gone looking for any such arrangement. Off the top of my head, without looking, I know of at least a few medium or high-profile players who would easily entertain such a relationship. James Ehnes probably knows who some of these people are too. Doesn't necessarily mean that either of us will go into more detail about it. April 7, 2013 at 01:20 AM · It's very difficult, but nevertheless interesting and important, to consider how modern and classic instruments might be compared fairly with proper controls for all of the key variables. Heck, we don't even necessarily know what the variables are. On the one hand, as James has pointed out there's the issue of needing to be with the instruments for significant time to acclimate and optimize. That is a very measured and perfectly rational demand -- albeit one that is difficult to meet experimentally. I personally find arguments like "how can so many of the best players be wrong" to be superficially compelling but scientifically very flawed because it is quite possible, perhaps even likely, that they are all subject to a common bias. "I just tried a $75,000 instrument that was made five years ago and seriously I think it's the best violin I've ever heard .... but wait ... no, it can't be better than my Strad, I mean, that's just not possible, is it? Even if I really think so, none of my professional peers are likely to agree, none of them plays a modern fiddle (except for what's-his-name) and they'll all think I've lost my marbles. Better keep playing the Strad to be on the safe side. There's gotta be a reason it cost 100 times as much." I read somewhere that even Hilary Hahn gets questions all the time about why she does not play a Strad but rather a mere Vuillaume. April 7, 2013 at 01:41 AM · Face it, we're brand-name crazy. Harold Schoenbaum's book on the social history of the violin indicates this sort of name-dropping promotional behavior isn't anything new, either. This thread is fascinating. The variety of ideas and professions entering the discussion is very helpful. At the end of the day we cannot expect a scientific study to answer a subjective question such as "which is best". Why are results of tests always over-interpreted? A rich investor probably owns an expensive, well provenanced violin for (at least) some preservation of his/her wealth. Lending it to a famous or up and coming virtuoso adds value to this investment and is itself a form of branding. I think everyone can be subject to the placebo effect (no value judgement) and even if there were no placebo effect on a player, there may be an expectation in many audiences regarding a violin to be played. How does the violin played by a performer affect his/her prospects, quite apart from their ability? April 7, 2013 at 05:22 PM · David brings up a good point, that of player testimonials. Every time I see an ad in which a great name is extolling the virtues of a certain violin, bow, case, whatever, I simply don't go for it. More often than not, at the very least the product was given for free. I think such ads are counter productive. I will also add that I have often had requests from violinists seeking to be testimonials in my printed ads. I think that's even worse, because most of the time they just want me to publicize them. Go figure! April 7, 2013 at 11:34 PM · James, thank you for your generous responses and thoughts! April 7, 2013 at 11:39 PM · Hi James and welcome to v.com! I'm a great admirer of yours and love your DVD - "Homage" where you play terrifically on great violins, violas and bows from the collection of David Fulton. As a professional violinist who loves violins - old and new, with 10 violins and 17 bows, this discussion is right up my alley. I've personally tried about 6 Strads, 2 del Gesus, a number of Guadagninis and Amatis, several Vuliaumes, etc. I love great classic violins and am also a great believer in contemporary violins with 6 that were custom-made for me. I will soon have a new blog of my own here focusing on two of my favorites. I don't think that it's as simple as old vs new. It depends a lot on the individual instrument the particular player - and even the listener. As an example of the latter, in "Homage" I consistently liked the Peter Guarneri. If another great violinist and done the same demonstrations I might have felt differently. Among the violins I've personally tried, a particular Amati was possibly the most beautiful for me. But I will say this: you certainly get the most bang for your buck with a modern fiddle. The top classic instruments have a complex pallette of colors that is no myth. However, many violins by Strad, et al are just ho-hum. Part of it may be condition or set-up. And part of it may be that even Strad could not bat 1,000, given all the variables that go into a fiddle. But I do believe that it is understandably in the interest of major dealers and auction houses to promote a special mystique around all classic fiddles that tonally, a great many do not live up to. And some players feel that it's important to their prestige and status to say that they play on a Strad or del Gesu. Some, like Tetzlaff indeed proudly extoll the virtues of their contemporary instruments, as do I in my more minor league (me, more minor, not my fiddles!) way. Interesting - it's usually one end or another. Few players proudly tell everyone about their unusually good Plattner, say! I am really open to possibilities and not bowled over by names. Once at an auction showing I far preferred a Carlo Biziach to a Strad. Just the other day, rumaging at Tarisio, my favorite violin, tonally was the Storioni (though it was riddled with cracks), and I also liked one of the Beckers a lot. I thought the Guadagnini was just OK. Of course that's just me, my taste and playing style. Which brings me back to my earlier point. It all depends upon the particular instrument, the individual player, and whatever chemistry results from that interaction. The bow is very important, too. April 8, 2013 at 03:22 AM · A fascinating thread, but with no disrespect intended to the most-loved performing artists, I think that Stradivarius is so widely acclaimed that it doesn't need analogy, but rather serves more widely for analogy itself, to the point where the question of questioning its value is bygone, and even if performers and listeners didn't use their association with players as a mark of distinction, and they were exactly as affordable as more modern but generally regarded as comparable if not slightly inferior, they would still be preferred due to accumulation of mystique. April 8, 2013 at 02:18 PM · Thanks, so kindly, to all the contributors to this remarkable thread. May all fine performers get to play instruments they love . . .
April 8, 2013 at 06:15 AM · How do we determine the actual “sound” of an instrument? From personal experience, it is easy to fool the listener in a blind test by playing, every time in a soloistic manner, the same instrument in four different ways. The optimal sound in an instrument comes with optimal playing conditions. If the only contact with the instrument is your collarbone, chinrest and left hand, no additional damping of the back will affect the sound (mechanic dynamic). In most cases, back squeezing performed by the tension in the shoulder rest will affect the sound. In the mid 70s, Ruggiero Ricci showed me his solution for a “not-squeezing-the-back” shoulder rest. The lower part of the back (of his shoulder rest) was on the outside doubled with an arched maple plate matching the wood of his Guarneri del Gesù. The plate did not touch anything. It only rested on the lower edge of the back, allowing the vibrations of the back while holding the instrument, to be freed from his damping shoulder support. The only thing that matters for me is that my violin inspires me with mutiple colours, and a quick response to my musical intensions in as effortless a way as possible. The more you have to deal with controlling the sound, the less capacity you have left for extraordinary performing. The personal customizing of your equipment - set up, bows, strings, chinrest etc. is individual and key for the performer. You grow and develop with a great instrument. In general, I have only found these qualities in great Cremonese violins, in particular the instruments made by Antonio Stradivari and Guarneri del Gesù. When my dear colleague in Cremona, Dimitri Musafia, in a way compares rare violin’s performance in the hands of great players with the performance of great sport car drivers, it reminds me of the Formula One race when Michael Schumacher won the Monaco Grand Prix in 2001. I was standing with a nice view over the Circuit around the harbour closely monitoring Michael’s mastery. Well, needless to say, the Ferrari performed wonderfully in Michael’s hands. Would he have been able to achieve the same magnificence in a less capable car? There are numerous examples of great soloists who, during their career, had to change instruments with, at times, disastrous consequences. There have also been many times that a string was broken during a concert and a quick exchange with the leader’s violin was necessary. The matchmaking process between soloist and instrument is like creating a wonderful lifelong marriage. David Oistrakh told me at his last performance in Stockholm, shortly before he died on October 24th, 1974, “You should have the capacity to give the impression of playing with 110%, but only use 85% of what you have to offer; this creates a safety net for you”. David often borrowed my orchestra colleague, Mircea Saulesco’s Goffredo Cappa violin for the dress rehearsals with the Swedish Radio Symphony Orchestra. It is a great violin but it did not match David’s Strad. David Oistrakh played the ex-Marsick Stradivari of 1705. When Igor Oistrakh inherited the ex-Marsick, it sounded, due to Igor’s personal sound, completely different. (James Ehnes plays the the ex-Marsick Stradivarius of 1715). I am told that Christian Tetzlaff had the Baron Rothschild, ex-Kux Stradivari of 1713 on loan for some time. This instrument is only 13 inches (345mm). I know this instrument particularly well. It belonged to a friend of mine and I played it every time we met. The sound is wonderful and penetrating, but not powerful. On the other hand, it is the conductor’s obligation to balance the volume of the orchestra in regard to the soloist. There are very few rare “virgin” instruments left. According to the late Jacques Francais, Nicolas Lupot regraded the plates on approximately 50 del Gesù violins. I have since then tried to get this statement confirmed, so far without success. Jacques once showed me a wonderful-looking Guarneri del Gesù and I played it, it sounded like a Suzuki violin. When I looked inside, it was easy to understand why. The violin was only roughly finished and had deep tool marks everywhere. On the same occasion, I had the pleasure of playing 6 Strads, 4 del Gesùs, the ex- Stern Bergonzi of 1733 and some very nice Amatis. They were all great violins in different ways. Suddenly Jacques showed me another del Gesù, the ex-Antonio Bazzini Guarneri del Gesù of 1742. This violin have 3 wolf tones, but is, in my opinion, one of the top del Gesùs. It totally blew my mind and, with a broad margin, outcompeted all the other instruments I tried that day. Within the last 10 years, I have seen three important instruments being reshaped dramatically in the back (considered being too thick) by well-renowned restorers. In Switzerland - a Francesco Rugeri, in UK - a Giovanni Grancino and in the US - a Voller brothers. I consider this to be acts of ignorance and stupidity. It is such a relief to see the great-sounding Antonio Gagliano of 1831, with a back of 6 mm, played by my friend Misha Keylin. Understanding the mechanics and physics of stringed instruments is key to being able to create the optimal acoustic result. Some of you writing on this member’s blog are aware of my being the promoter of the "’Stradivari’ Master in Science and Technology of String Instrument” and the open-source International Research and Development Centre in Cremona. The results we are achieving are shared with the international violinmaking community. Please Google "Stradivari" Master in Science and Technology of String Instruments. If you would like to contribute funding for this project, please Google the non-profit organisation Fondazione Maestro Cremona. Look for the Stradivari Master’s Degree in the menu bar. The Master’s Degree at the Politecnico Di Milano’s Cremona Campus, was last year postponed one year. The prior educational levels of the students are demanding. A Master of Science in Engineering, Computer Science, Mathematics or Physics is required. Most of the applicants did not want to give up good jobs only because of the Italian Academic Senate’s strict rules in regard to not accepting many candidates’ suggested alternative procedures of participating in the coursework. I am very optimistic that one day, in the near future, we will be able to - from a sound and playability point of view - make the most wonderful instruments. However, the mentality of the Renaissance artists is dead. The divine mastery to be found everywhere displayed in the work created for churches, royalties and noble families will not easily come true again.